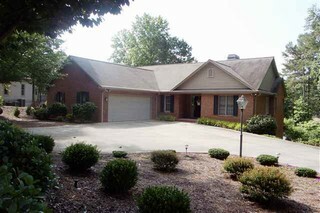 Gorgeous 5BD/4BA Keowee Lake Front Home. This home has it all: gorgeous lake views from almost every room, 3455 Square Feet, large master suite onmain level, large open kitchen, Silestone countertops, hot water re-circulating system for immediate hot water, screened porch, 2 decks, patio, largeworkshop and much more! Outside enjoy the gentle slope on a stone walkway to an ironwood pier supporting the covered dock secured with pilings (dockhas electricity and Pier has electricity and water) and a sandy beach for the kids! Other extras include: a beaver fence to protect the beautiful landscaping, 4station pop-up/drip irrigation, audible motion activated driveway monitor, security system (owned/monitored), gutter helmet (no gutter cleaning), power outlets in the yard for your holiday decorations, 8 etra inches of insulation in the attic, and more!